Today, we are much happy to have the chance to share and recognize our accomplishments throughout the nation. 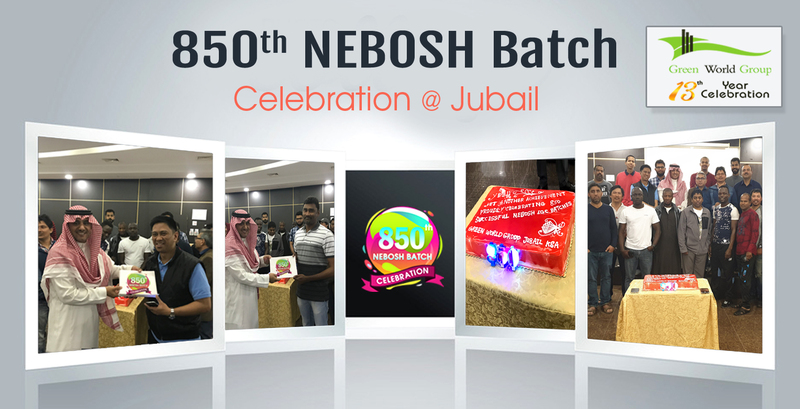 We have recently celebrated our 850th NEBOSH IGC batch in Jubail on 11th March. It is one among the great achievement for Green World Group and we have rendered strenuous endeavors to accomplish this and we are urging to accomplish more. This moment is energizing and empowering us. As an active group, we have been working hard to ensure our health and safety programs provide the best professional support to thousands of individuals. NEBOSH International General Certificate provides your approach to further progress by increasing the performance, productivity and safe workplace. It is an essential and basic health and safety qualification for each individual who wants a career in HSE field. Taking up any course in Green World Group is different from an ordinary learning experience. The study period will make you into an expert in the health and safety field with all necessary skills and knowledge to work in any kind of workplace. The excellent achievements in our records are the greatest gift contributed by our students. Our training methodology, pleasant classrooms, available centers and high pass rates in exams make Green World Group the most desirable health and safety institute for individuals.